When the Four Horsemen launched their Kickstarter, they had six birds ready to go - the rest were left to be stretch goals. The third unlocked was the phoenix, eventually named Phoenius. Not a great name, what with the way it suggests "phony," but you can rename him whatever you want. 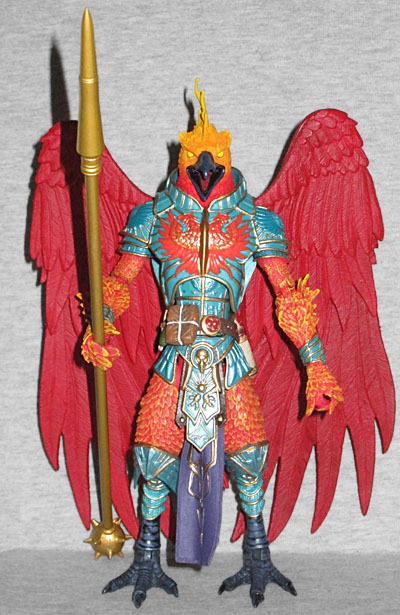 His armor is a bright metallic blue, which contrasts delightfully with his orange and yellow feathers. His loincloth is indigo, and his feet are dark blue. There are no add-on wings specifically designed to match him, but the red ones look great on him. The variant birds don't get the same ornate weapon as Decimus - just a staff with the spiked mace head on one end, and a sharp spike on the other. Phoenius' head is quite nice. It's shaped like an eagle or falcon, but is distinctly not. The beak is the same blue as the feet, just glossy instead of matte, and his feathers form an eyebrow ridge above his blank yellow eyes. He has a crest on his head like a cockatoo, which then looks like rising flame. 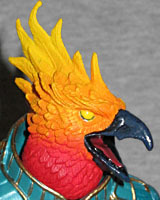 While the feathers on his body are orange with yellow tips (an impressively complex paint app), the head fades from solid red at the bottom to orange in the middle and yellow on the top, which is why the red wings work for him.